The Ferry Bluff Eagle Council was founded in 1988 by a small group of environmental and bald eagle enthusiasts “to protect, maintain and enhance bald eagle habitat in the Sauk Prairie area through education, research and management activities”. They modeled the group after the Eagle Valley Environmentalists, a similar community group studying eagles along the Mississippi River in Grant County, Wisconsin, for several years. The Ferry Bluff roosting area, at that time the roost best known to the founders and thought to be the main roost within the Sauk-Prairie habitat area, was designated a State Natural Area under the direction of the FBEC and DNR. The area is still managed by the DNR, in conjunction with input from the FBEC. In 1991 the group hired three interns to map the Sauk Prairie habitat area, identifying roosting, perching and feeding areas. Since that time an extraordinary volunteer force has continued these efforts. What were six roosts along 15 miles of river were mapped and counted by 1992. Now, FBEC monitors 15 roosts along 30 miles of river and hundreds of square miles of land off the river. 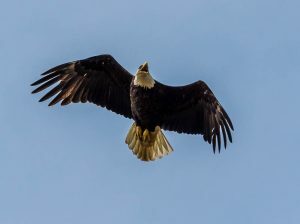 In 1990 a viewing area was established in the municipal parking lot in Prairie du Sac, overlooking Eagle Island, giving visitors a protected area to view and photograph eagles. This viewing area, the Overlook, is still one of the best areas for visitors to view bald eagles. In 1993 a permanent telescope was installed at the Overlook, and in 2014 a permanent telescope was installed on the Riverwalk in Sauk City. In January of 1990 FBEC joined with the Bureau of Endangered Resources in staging Bald Eagle Watching Days, a family-based celebration and educational event of bald eagles in general and specifically bald eagles in the Sauk Prairie area. At that time Bald Eagle Watching Days were held in the local community center but the popularity of the event led to the addition of speakers and events and it quickly became community-wide. Today it is a premier winter destination that attracts bald eagle watchers of all ages from throughout Wisconsin and beyond. FBEC has collaborated with the DNR, the Lower Wisconsin State Riverway, and local municipalities on a variety of land use and bald eagle habitat issues. This communication continues today, as the FBEC is recognized as a major stake-holder by the DNR, Lower Wisconsin Riverway, and other state and local agencies in any activity affecting the land in the extended habitat area. Given FBEC’s educational directive, a wide variety of educational materials have been produced over the years, both for general consumption and for use in schools. FBEC maps and records vital eagle habitat information along the Wisconsin River and throughout the extended Sauk Prairie habitat area. The extraordinary success of FBEC and similar groups has helped to bring the bald eagle population back from precarious numbers just 30 years ago. When the group was founded bald eagle nests were a rarity in the Sauk Prairie habitat area; by 2014 that number grew to well over 20 today. With this diversifying habitat, FBEC expanded the focus of its mission from wintering to year round bald eagle habitat information. FBEC’s exciting, new, extended year-around mission is both opening new doors of opportunity and presenting new challenges for the future.